The Circulatory System is the main transportation and cooling system for the body. The Red Blood Cells act like billions of little UPS trucks carrying all sorts of packages that are needed by all the cells in the body. Instead of UPS, I'll call them RBC's. RBC's carry oxygen and nutrients to the cells. Every cell in the body requires oxygen to remain alive. Besides RBC's, there are also White Blood Cells moving in the circulatory system traffic. White Blood Cells are the paramedics, police and street cleaners of the circulatory system. Anytime we have a cold, a cut, or an infection the WBC's go to work. The highway system of the Circulatory System consists off a lot of one way streets. The superhighways of the circulatory system are the veins and arteries. Veins are used to carry blood *to* the heart. Arteries carry blood *away* from the heart. Most of the time, blood in the veins is blood where most of the oxygen and nutrients have already been delivered to the cells. This blood is called deoxygenated and is very *dark* red. Most of the time blood in the arteries is loaded with oxygen and nutrients and the color is very *bright* red. There is one artery that carries deoxygenated blood and there are some veins that carry oxygenated blood. To get to the bottom of this little mystery we need to talk about the Heart and Lungs. This is a subject that is near and dear to my heart. The heart is a two sided, four chambered pump. It is made up mostly of muscle. Heart muscle is very special. Unlike all the other muscles in the body, the heart muscle cannot afford to get tired. Imagine what would happen if every 15 minutes or so the pump got tired and decided to take a little nap! Not a pretty sight. So, heart muscle is always expanding and contracting, usually at between 60 and 100 beats per minute. The right side of the heart is the low pressure side. Its main job is to push the RBC's, cargo bays mostly empty now, up to the lungs (loading docks and filling stations) so that they can get recharged with oxygen. Blood enters the right heart through a chamber called the Right Atrium. Atrium is another word for an 'entry room.' Since the right atrium is located *above* the Right Ventricle, a combination of gravity and an easy squeeze pushes the blood though the Tricuspid Valve into the right ventricle. The tricuspid valve is a valve made up of three 'leaflets' that allows blood to go from top to bottom in the heart but closes to prevent the blood from backing up into the right atrium when the right ventricle squeezes. After the blood is in the right ventricle, the right ventricle begins its contraction to push the blood out toward the lungs. Remember that this blood is deoxygenated. The blood leaves the right ventricle and enters the *pulmonary artery. * This artery and its two branches are the only arteries in the body to carry deoxygenated blood. Important: Arteries carry blood *away* from the heart. There is nothing in the definition that says blood has to be oxygenated. When the blood leaves the pulmonary arteries it enters *capillaries* in the lungs. Capillaries are very, very small blood vessels that act as the connectors between veins and arteries. The capillaries in the lungs are very special because they are located against the *alveoli* or air sacks. When blood in the capillaries goes past the air sacks, the RBC's pick up oxygen. The alveoli are like the loading docks where trucks pick up their load. Capillaries are so small, in some places, that only *one* RBC at a time can get through! When the blood has picked up its oxygen, it enters some blood vessels known as the *cardiac veins. * This is fully oxygenated blood and it is now in veins. Remember: Veins take blood to the heart. The cardiac veins empty into the *left atrium. * The left side of the heart is the high pressure side, its job is to push the blood out to the body. The left atrium sits on top of the *left ventricle* and is separated from it by the *mitral valve*. The mitral valve is named this because it resembles, to some people, a Bishop's Mitered Hat. This valve has the same function as the tricuspid valve, it prevents blood from being pushed from the left ventricle back up to the left atrium. The left ventricle is a very high pressure pump. Its main job is to produce enough pressure to push the blood out of the heart and into the body's circulation. When the blood leaves the left ventricle it enters the Aorta. There are valves located at the opening of the Aorta that prevent the blood from backing up into the ventricle. As soon as the blood is in the aorta, there are arteries called *coronary arteries* that take some of the blood and use it to nourish the heart muscle. Remember: the heart is like James Brown, it's the hardest working muscle in the body (in case you don't know, James Brown says he's the hardest working man in show business). The aorta leaves the heart and heads toward, what else, the head. We have to keep our brains well nourished so we can make good grades in school. The arteries that take the blood to the head are located on something called the *aortic arch. 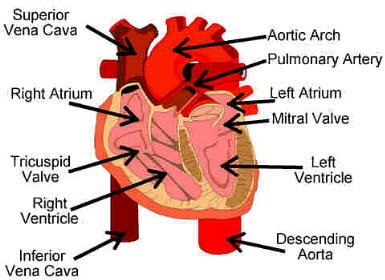 * After the blood passes through the aortic arch it is then distributed to the rest of the body. The *descending aorta* goes behind the heart and down the center of the body. Sometimes, if you are lying flat on your back, you can look down toward your feet and actually see your abdomen pulsate with each heart beat. This pulsation is really the aorta throbbing with each heart beat. Do not be alarmed, this is normal. From the aorta, blood is sent off to many other arteries and arterioles (very small arteries) where it gives oxygen and nutrition to *every* cell in the body. At the end of the arterioles are, guess what, capillaries. The blood gives up its cargo as it passes through the capillaries and enters the venous system. The venous system carries the blood back to the heart. The blood flows from the capillaries, to venules (very small veins), to veins. The two largest veins in the body are the *superior* and *inferior* vena cavas. The superior vena cava carries the blood from the upper part of the body to the heart. The inferior vena cava carries the blood from the lower body to the heart. In medical terms, *superior* means above and *inferior* means under. Many people believe that the blood in the veins is *blue*; it is not. Venous blood is really dark red or maroon in color. Veins do have a bluish appearance and this may be why people think venous blood is blue. Both the superior and inferior vena cava end in the right atrium. The superior vena cava enters from the top and the inferior vena cava enters from the bottom. This completes our little journey through the circulatory system. I hope the blood has continued to flow to your brain as you read this and you managed to stay awake. If you dozed off, it's o.k., I doze off myself from time to time when I read really boring stuff. There are lots of things that I did not talk about, such as how the cooling system works, but I thought that you might like to look some of this stuff up by yourself. As usual, I know you will have questions for me. I can't wait to hear from you.